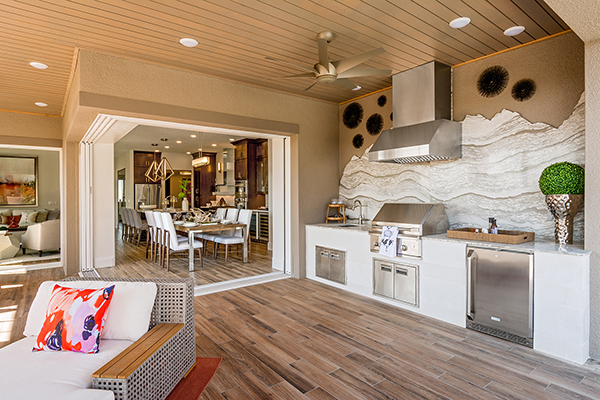 With collaboration from Lita Dirks & Co., Taylor Morrison, Housing Design Matters and Hanley Wood, the NEXTadventure Home features innovative interior design, a flexible floor plan and the latest and greatest appliances. Knowing that our market was the active adult, the design of the NEXTadventure Home was clean, crisp and comfortable,” states Amy Miller, Lita Dirks & Co.’s lead designer on this project. “The 55+ buyer is looking for excitement and style, but they don’t want to sacrifice the cozy and inviting atmosphere of their home." The Florida Home Builders Association (FHBA), along with the Southeastern Builders Conference (SEBC), honored the industry’s most creative and successful designers, developers, builders, planners and architects at the 36th Annual Aurora Awards in Kissimmee, FL on July 28, 2017. This year’s competition drew 400 entries in 55 categories including commercial, office space, renovated projects, mixed-use, affordable, multi-family projects, site planning, single family production and custom homes. Winning the Grand Aurora (Single Family Detached Home - 2,000 to 2,499 sq. ft.) and the Silver Aurora (Best Kitchen - $500,000 to $1,000,000), the NEXTadventure Home showcases the future of the 55+ housing market. With collaboration from Lita Dirks & Co., Taylor Morrison, Housing Design Matters and Hanley Wood, the home features innovative interior design, a flexible floor plan and the latest and greatest appliances. “We were honored to have been chosen to create the design and merchandising for this stunning show home,” says Lita Dirks, owner of Lita Dirks & Co. Located in Greenwood Village, CO, Lita Dirks & Co. is a highly acclaimed and award-winning interior design and model merchandising firm that successfully partners with builders, property management companies and developers to create communities that inspire buyers and sell homes. The talented team of professionals at Lita Dirks & Co. has designed successful model homes, clubhouses, apartments, and sales/design centers across the country for over 25 years.